Alvi Technologies has introduced a new multi-parameter, dual-channel analyser designed to collect data from up to 64 sensors in measurement applications. A fixed analyser is usually mounted near the sensor when making pH/ORP, conductivity, and oxygen measurements. Representing a significant portion of the loop, these analysers serve as display, calibration tool, and a source of the output signals for data collection. However, these analysers are not only limited in functionality and flexibility but are also expensive. Many end-users of these analysers work within these limitations by using a fixed device mounted on the pipe, wall or panel, with analogue outputs representing their process variables. Alvi has now released an optimal solution for integrating a compact and flexible digital analyser in an extremely cost-effective manner. The new MemoRail Modbus A1405N is a multi-parameter, dual-channel analyser that can be used with Memosens and digital sensors such as pH (glass and IsFET), ORP (redox), oxygen, and conductivity (conductive and inductive). The only analyser in its class that is suitable for use with a digital optical oxygen sensor, the MemoRail Modbus supports all sensor types in any combination in the dual-channel version. MemoRail Modbus dual channel analysers provide a complete digital loop. The Memosens sensors eliminate noise due to complete galvanic isolation and the inductive connection; allow offline calibration; and provide enhanced sensor diagnostics. 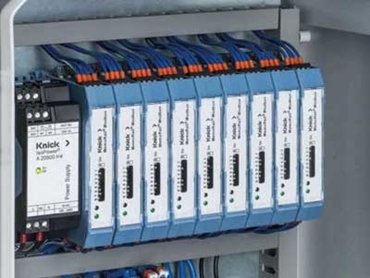 The Modbus RTU communication allows calibration to be performed directly from the end-user’s PLC or HMI; enables sensor diagnostics to be displayed on HMI; and connects 32 transmitters (up to 64 sensors) to one Modbus master. MemoRail Modbus is a 17.5mm wide DIN-rail mounted analyser, allowing users to collect data from up to 64 sensors from only 560mm of DIN rail. Since calibration can now be done offline or directly from an HMI, the traditional analyser display is not required any more. Available at a fraction of the cost of a traditional analyser, MemoRail Modbus helps reduce ownership cost while improving performance.